Kingswood Oxford held its first Students of Color Summit on March 3. The student-led program organized by the Girls of Color group examined pressing topics of diversity and inclusion. Schools in attendance included Avon Old Farms, Grace Academy and Miss Porter's School. After attending a similar program at Loomis Chaffee School in the fall, several KO students decided to initiate an event at KO as an opportunity to meet different students of color in the local area. Director of Diversity, Inclusion and Cultural Competency Joan Edwards, believing in the power of student ownership said, “I wanted it to be their event. My goal for them was to be successful and support them, not to step in and solve problems for them. There were so many things they needed to consider and some things they couldn’t anticipate.” The students impressed Edwards with their ability to pivot and find solutions on the spot in hosting this special event. The event began with icebreakers to loosen the students up for the emotional heavy lifting that was required later on in the day. Organized into three themes, “Breaking the Status Quo”, “Busting the Narrative”, and “Showing Strength Where Weakness is Expected,” the panel included a speaker for each topic including KO faculty member David Herrera, Josie Pinero ’20 and Winston Ware ’20. Following a lunch of fried chicken, cornbread, collard greens catered from Lilly’s Soul Food in Windsor, the students discussed affinity groups based upon how they self-identified as people of color. The KO student organizers responded to the interests of the attendees by selecting subject matter that the attendees themselves said they wanted to hear. Topics for the hour-long break out groups, run by the student organizers, included cultural appropriation, adoption of cultural elements from a minority culture by members of a dominant culture; colorism, the preferential treatment and/or discrimination based on skin color; racial tension in a predominantly white institution; and racist jokes. 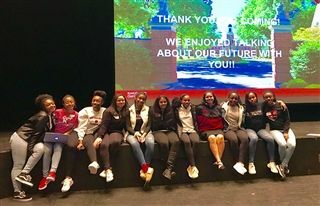 Ananya Alleyne ’19, one of the co-founders of the Girls of Color group with Pinero, said that despite some setbacks the day of the event, the assembled group had very meaningful discussions. “We had some very nice interactive discussions that we don’t have every day with people with similar interests,” Alleyne said. Next year she hopes the summit will continue, grow stronger and build off the solid foundation they established this year. Running a special event requires a strong team with a varied skill set that coordinates various responsibilities. “I learned that when things don’t go as planned, you shouldn’t focus on what’s going wrong, but finding solutions," Alleyne said. In addition to their inspiring work, the students learned to execute with grace under pressure and to think on their feet. “I’m so happy for them that they had this meaningful experience for their community, created a plan and executed it. And when unexpected things occurred, they kicked the ball back into play,” Edwards said.